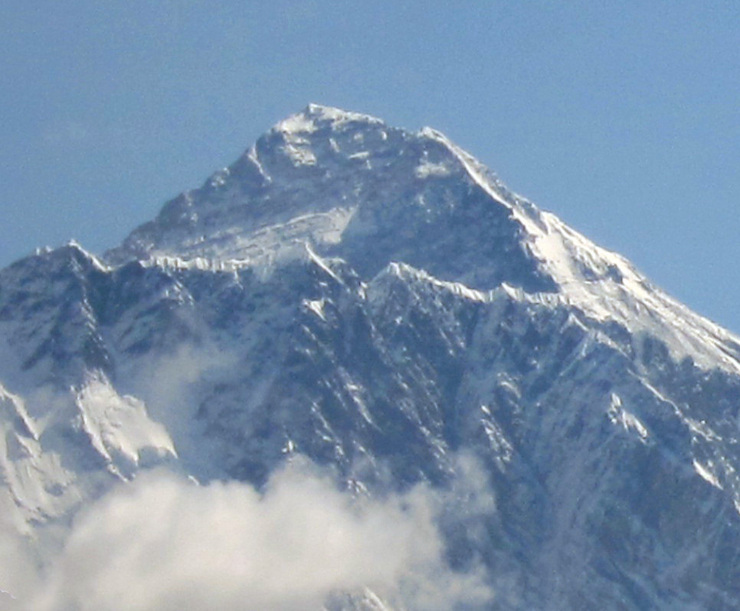 About a year ago, Brian Stauffer asked me if I had ever seriously thought about going to Mount Everest. I don't know if he had seen my much earlier post about Tenzing and Hillary, - but he knew we shared lifelong fascinations with the Himalayas. It sounded exciting to me, and having assured my wife that there was no risk involved and found a time that worked, I signed on. This was the beginning of a year of planning and training which cumulated earlier this month when we went to Nepal to undergo a 12 day expedition to Everest Base Camp. 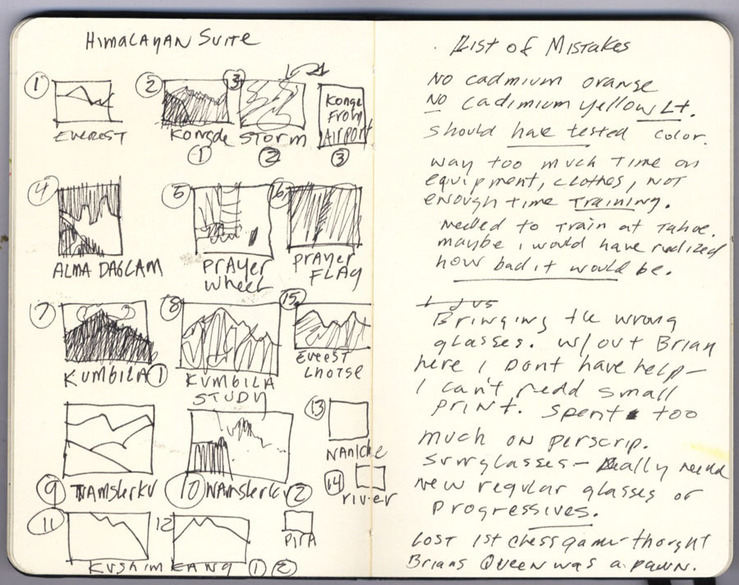 As illustrators, we both made plans to document the trip through artwork. I have done a number of reportorial projects (Reconstruction of the Bay Bridge, Tour de France etc) in the past, but always worked primarily from photographs. 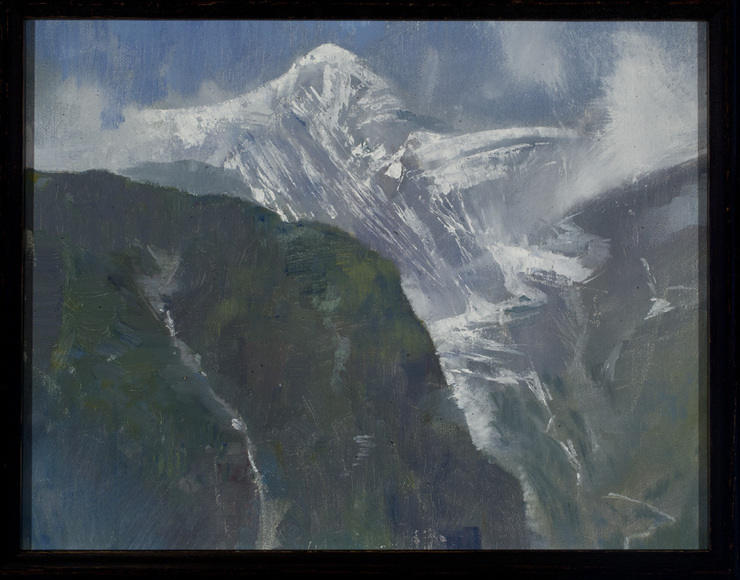 This time I wanted to do something different- I wanted to paint on from life, on location in these places where, as far as I know, no one had done it before. In terms of physical training, it primarily consisted of climbing Mount Tamalpias, and Bald Hill, at 2400 and 1100 feet respectively, at least 5 days a week for the three months before the trek. Though this did make me far stronger, it did little to help with my ability to cope with altitude, which turned out to be my Achilles heel. Evererst Base Camp is at 17,400 feet. 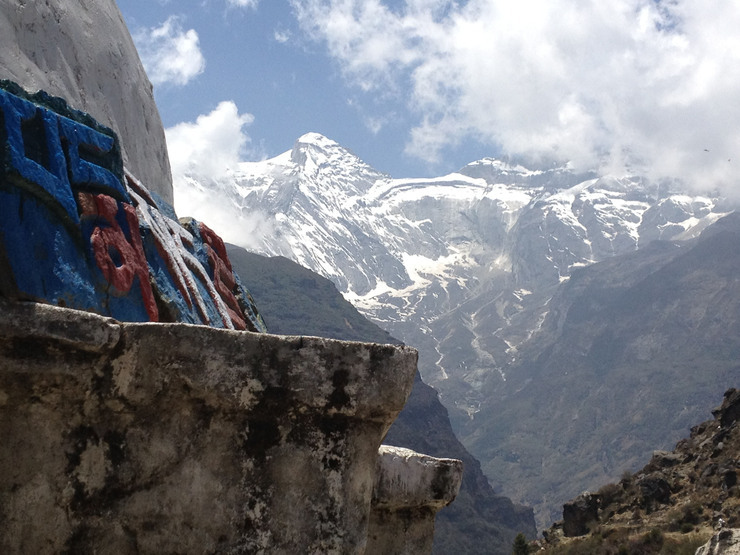 Lukla, where our trek began, is at 9200, both higher elevations than I had ever been in my life. Following 17 hours of flying, we met our guide, Kim Rana, at the Kathmandu airport. After a pre-trek dinner at a local restaurant (at which some extremely strong local beverages were served) we headed back to the airport (where we made the observation that there were dozens of monkeys on the runway!) for the 25 minute stomach- turning flight to Lukla in a 16 seat "twin otter".- Lukla being statistically the most dangerous airport in the world. To my relief the flight was uneventful and after some comic relief with our luggage we set off. 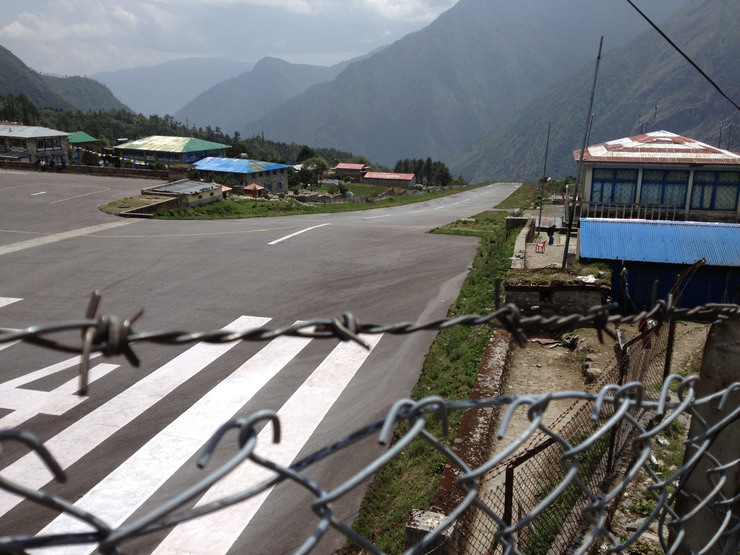 The Lukla airstrip.That's right, its downhill 12 degrees. Very little margin for error. I spent a lot of time planning out a strategy to bring materials and tools to paint without making my equipment too heavy for our porter, who would carry most of our stuff. 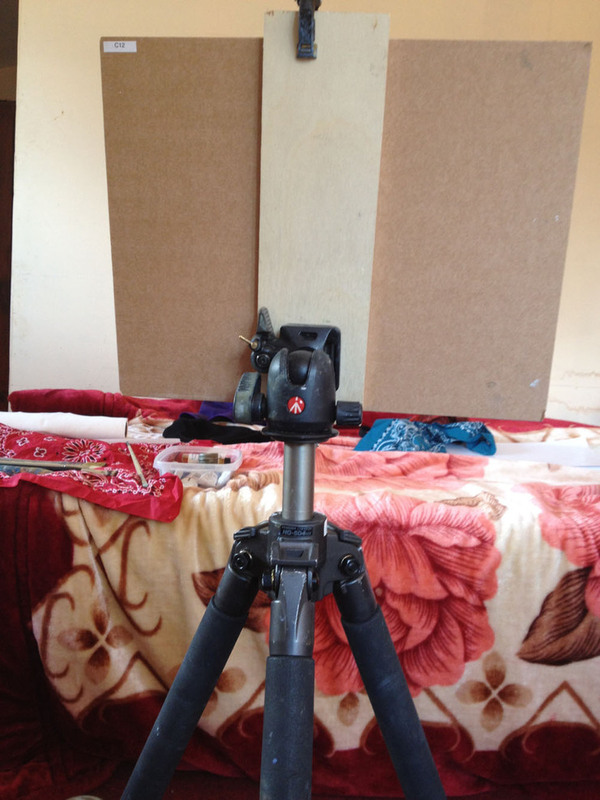 I built a very simple easel from a carbon fiber tripod and a small piece of wood on a ball-head. 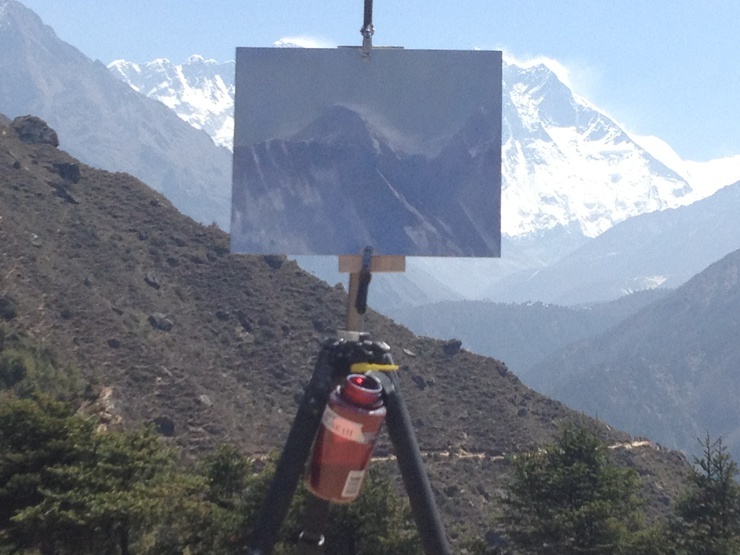 The easel has an apron that can hang below it, in which one places a weight-usually a rock- to stabilize it. This easel was a tool dedicated to 11x14 inch linen panels, of which I brought 5- the theory was that if a painting didnt work, I would wipe it off and re-use the panel until I got something good. I modified a wet-panel carrier box to hold 5 paintings and a thin wood pallate. I brought only 4 tubes of Holbein duo water soluable oil paint, a small tube of lindseed oil, 15 sheets of viva paper towels (three sheets per painting) and 5 brushes. 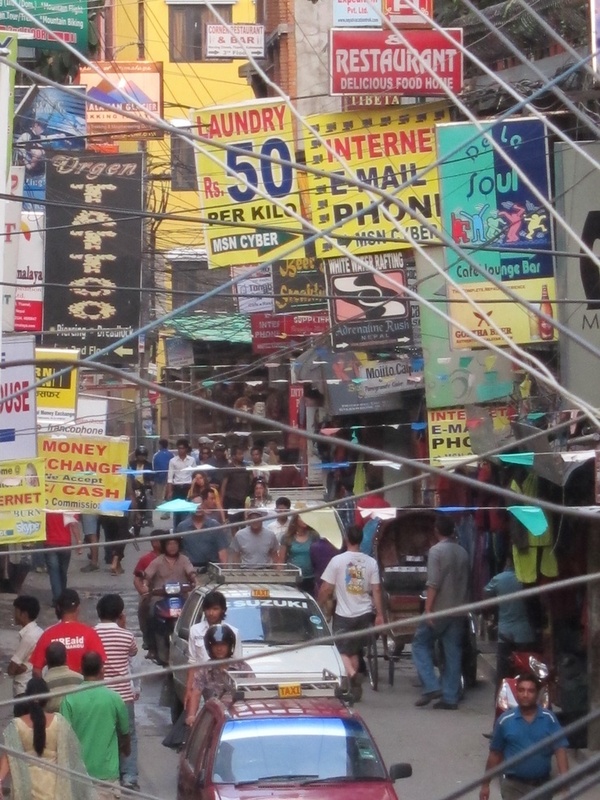 I arranged in advance to purchase some turpentine in Kathmandu - which proved more complicated than it sounds. It all fit into a very light and cheap backpack that I put in the duffel bag containing most of my gear. 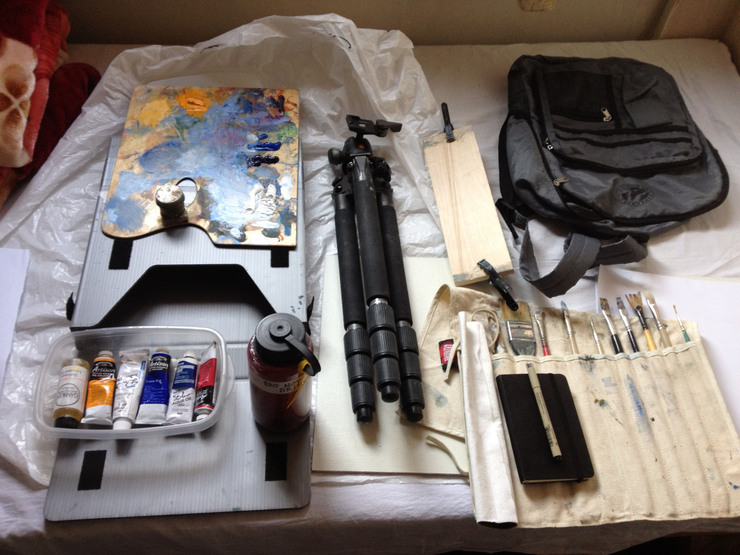 The idea was to haul out the painting equipment once we arrived in each day's destination. I underestimated how exhausted we would be at the end of the day's trekking. a super-light and simple painting easel- a tripod, a 4x12x1/4" piece of wood with a quick release plate, and two spring clips. Really, it's all you need. We hiked from Lukla (9200 ft) to Phakding. On this day we lost net 500 feet of elevation, but even so, it felt like a very hard days' work to get there. We learned that nothing is EVER level, you are either going up or down a hill at all times...so even if there is little net gain or loss of altitude you wind up doing a LOT of climbing wherever you go. Everything on the trip was visually overwhelming, and I now realize that the exotic and unnacustomed nature of everything around me prevented me from listening to my body as much as I should have. in retrospect, I probably was already getting sick from the altitude by the time we reached Lukla. 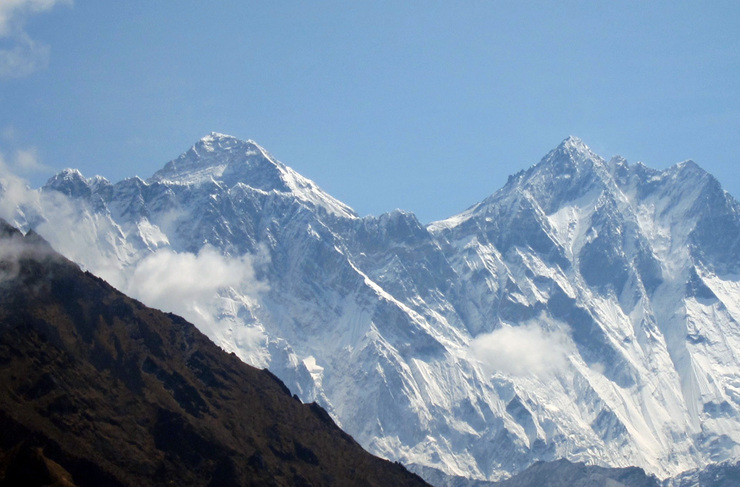 The next day was to be one of the hardest days of the trek- the climb from Phakding to Namche Bazar. Before the climb we crossed five hanging bridges. As we crossed the fourth bridge at Monju I began to feel nauseous. Kim tried to convince me to eat something but I couldn't force myself to swallow anything. 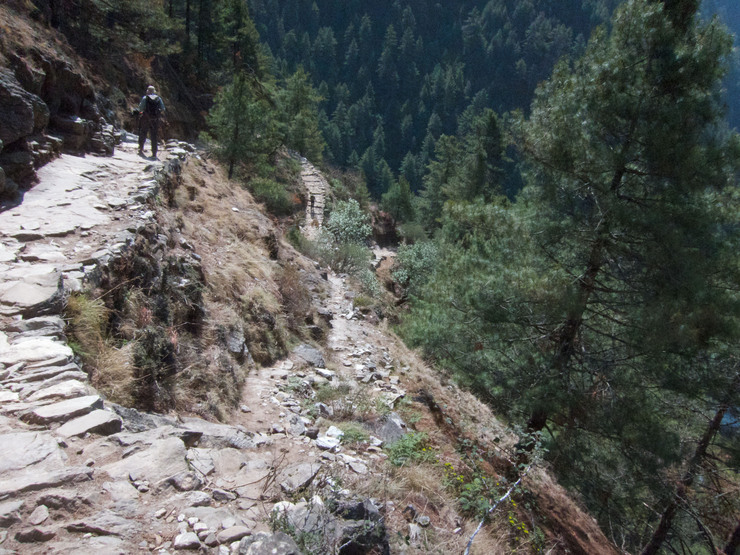 Then we headed up the climb to Namche. "I have no right to be here". Someone getting rescued. We saw many of these rescues every day. I didn't want to be on one. After 7 hours on the road- an hour longer than it should have taken- we arrived at Namche Bazar, and looking around realized we were now surrounded by gigantic mountains. Having taken note of this, I collapsed and slept for several hours at the teahouse where we were to spend the night. Eventually Kim woke me up for dinner- but I coudnt eat anything but a little soup. Still I felt like I would be OK if I could get a nights sleep, since the next day was to be an acclimatization day. These days arent rest days-you simply hike to a higher altitude and come back- the idea being that it helps your body acclimate. The next morning I still felt sick. Kim then said something that became important in making future decisions "if you cant eat, you can't climb". 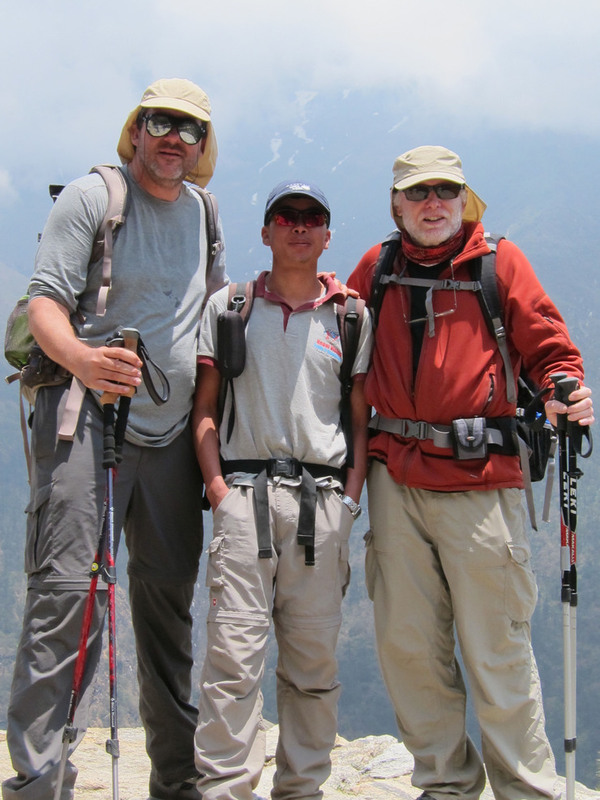 Brian, Kim and I headed out to do our acclimatization hike but I had to turn back before I even got out of Namche. The nausea and lack of energy was forcing me to walk at such a slow pace that I decided to return to the teahouse and take the day off. 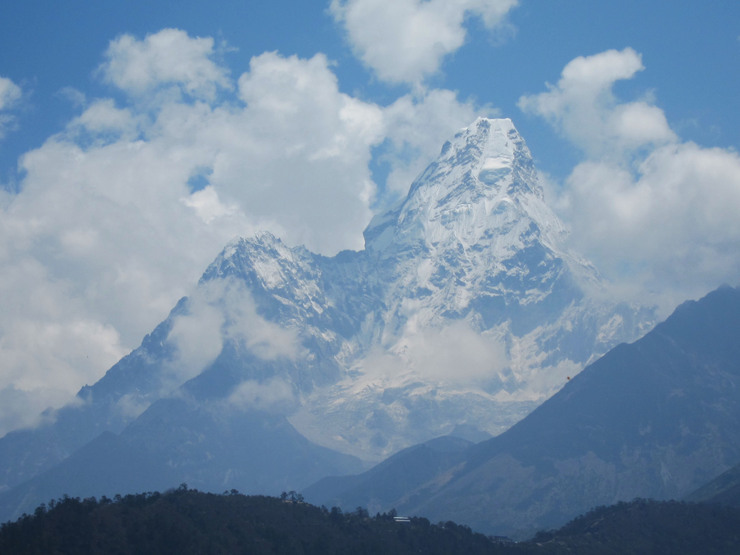 By the time they returned, I felt better and went on a shorter acclimatization hike with Kim to the Sagramantha National Park entrance, 300 meters above Namche, from which I got my first view of Mount Everest. But by the time I got back down the hill, I was sick again. Because of the nature of our schedule, I knew I had to start thinking about Plan B. That night Kim, Brian and I discussed the situation. I decided that if I still was sick in the morning that I would stay in Namche by myself and wait for Brian and Kim to go to base camp- 5 days away. And as I still felt sick the next morning (now having eaten almost nothing for three days), Kim made arrangements for me at the teahouse, and I hiked up the ridiculously steep 300 meter climb to the top of the hill above Namche with my friends and then waved them good bye. Watching them head off towards base camp without me was very, very hard...but it really was not a decision at all. Decision implies choice, but the truth is there wasn't one. If I had tried to keep going at that point, I almost certainly would have had to be rescued in a day or two by helicopter. I comforted myself in the knowledge that being suceptible to altitude sickness is not a sign of weakness but merely a biological condition that is unpredicatable and cant be prepared for. I kept telling myself that- but I felt like I had failed. And I knew there was only one thing I could do to redeem myself, if only in my own mind, which was to do what I had come there to do- paint. I had been given Lemons- now I had six days to make lemonade. looking down at Namche Bazar. Our teahouse residence was at the very bottom, in the lower left corner of this photo.You can see the steps going down into the town on the right. 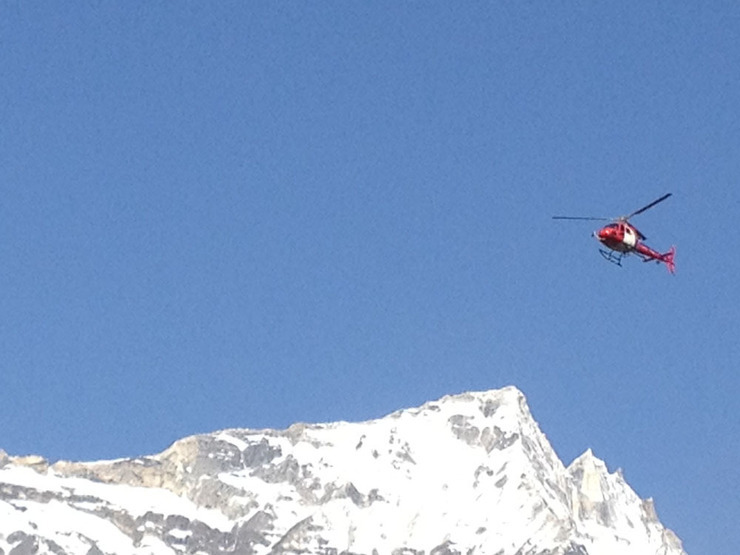 Looking the other direction...300 meters above Namche, and - there it was! 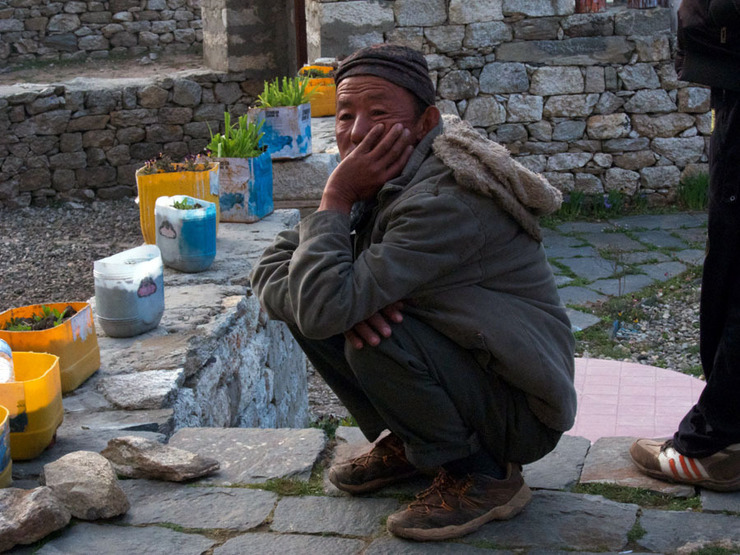 On the third day in Namche - the first full day without my companions, I hit rock bottom. I made hundreds of dollars in phone calls home, felt generally sorry for myself and was physically and emotionally feeling miserable. I made an agonizingly slow climb up the hill to the internet cafe, and collapsed upon return to my sleeping bag. I began to seriously consider going back down the hill to Monju, or returning to Lukla and flying home. Both of those options sounded like total failure to me. I held out and hoped to feel better soon. On the forth day, I woke up, and I was fine. 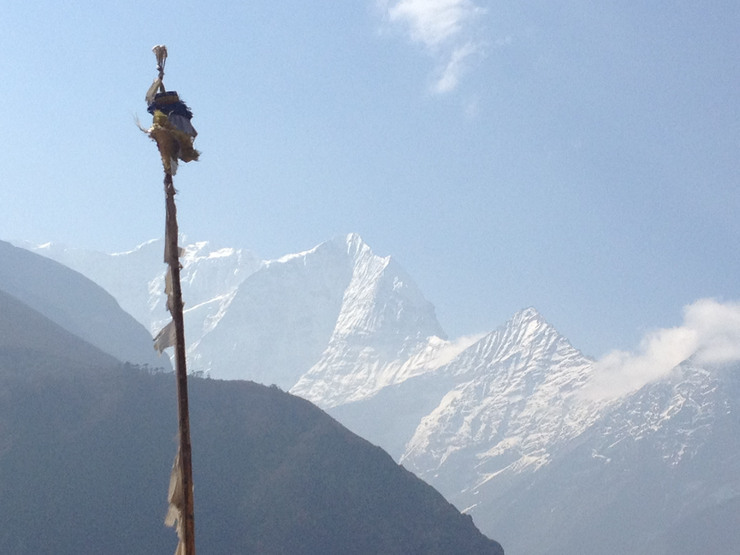 I don't know what happened or why it took 4 days, but i felt completely normal on the forth day in Namche. I ate breakfast like a normal person, walked up the hill to the internet cafe- and I didnt have to stop every 20 feet. Best of all, I started to be able to look around- and I realized that I was in the middle of the Himylayas. Suddenly the 4 remaining days seemed less like a jail sentence and more like an opportunity. I organized my painting stuff and headed out the door and got to work. 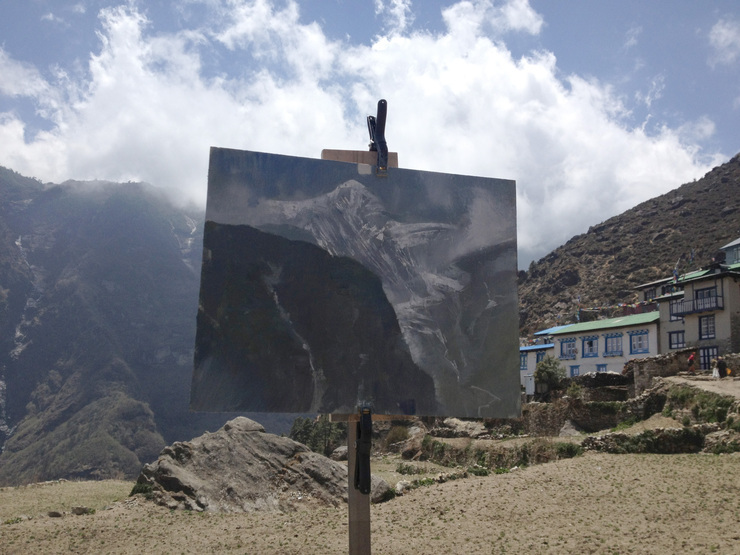 My first attempt was Kongde Ri, a complex mountain that looms above the west side of Namche. 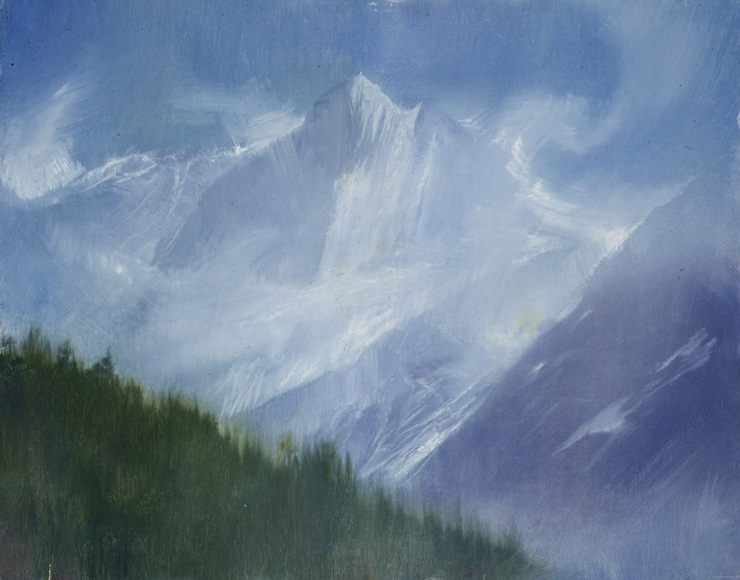 I often tell students that doing a landscape painting is solving a series of problems, many of which are unique to each painting. Never was this more true for me than in Nepal. The light was extremely bright, but you can't paint in sunglasses. It was hard to orient one's canvas to be in the same light as the subject, because the paths are narrow and you cant just set up in a field. The weather changes in minutes from sun to clouds. The wind gusts can be incredible. And other people and things use the paths. large farm animals, either in caravans or on the loose, roam around and you have to get out of the way. On the first painting, I thought I had a good spot but after about an hour a cow came along and in the scramble to get out of it's way I knocked over my turpentine container, which went all over all my supplies, coat and brushes, which were laying on the ground. This was a mixed blessing, because the "turpentine" I had bought in Kathmandu turned out to be - well I have no idea what it was but it smelled like gasoline and I couldn't stand the smell. I threw it out, and worked the rest of the time with out any solvent except water, which I only used to clean the brushes. A gust of wind also came up and, despite the easel being weighted down with a cobblestone-sized granite block, lifted the easel off the ground and it hit me, the painting flew off down and blew the trail...face down. This was amusing to the crowd of onlookers who had gathered- unlike Americans, the Nepalese people are friendly to strangers and seemed interested in helping me paint, they would stand behind me and helpfully offer suggestions , especially on the geographic accuracy and spiritual significance of various parts of my paintings. All in Nepalese of course. Still the results were encouraging. 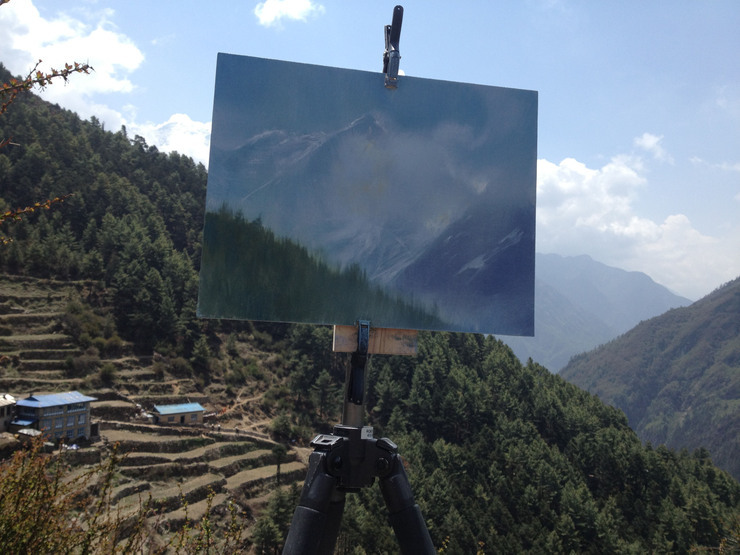 the view from Kongde Ri from Namche. Even though it wasn't base camp, it felt like another world...it WAS another world. Using my newly recovered strength, the next morning I climbed up to the park entrance. What had been a terrible ordeal 2 days earlier was now relatively easy to do...I went up there and looked for a subject to paint- many of the peaks looked more dramatic andc closer than Everest, but a voice in my head said- "Thats mount Everest- and you are here- you have to paint it!". I had started to have a daily routine, the light and weather was only good in the morning, overcast, wind and rain was the weather in the afternoons. 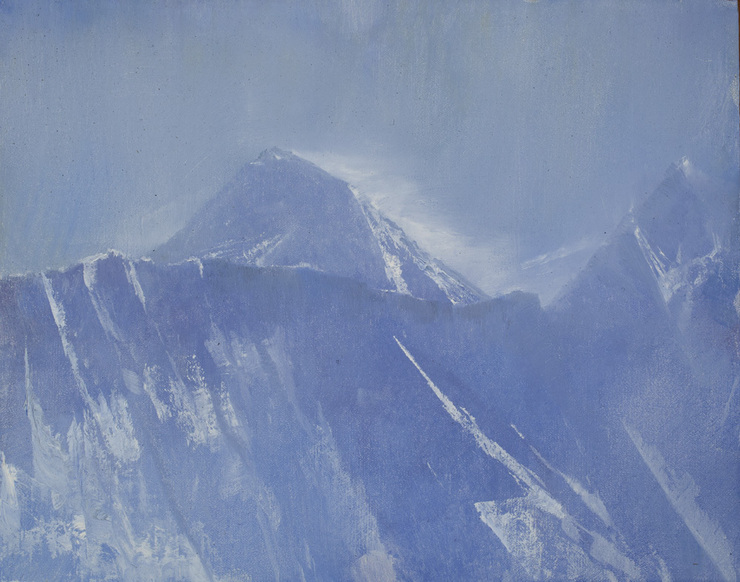 The next morning I tried to paint Tamsherku from a little below Namche on the trial. An elderly gentleman sat next to me and watched me work the whole time and chatted with me in incomprehensible (to me) Nepalese. 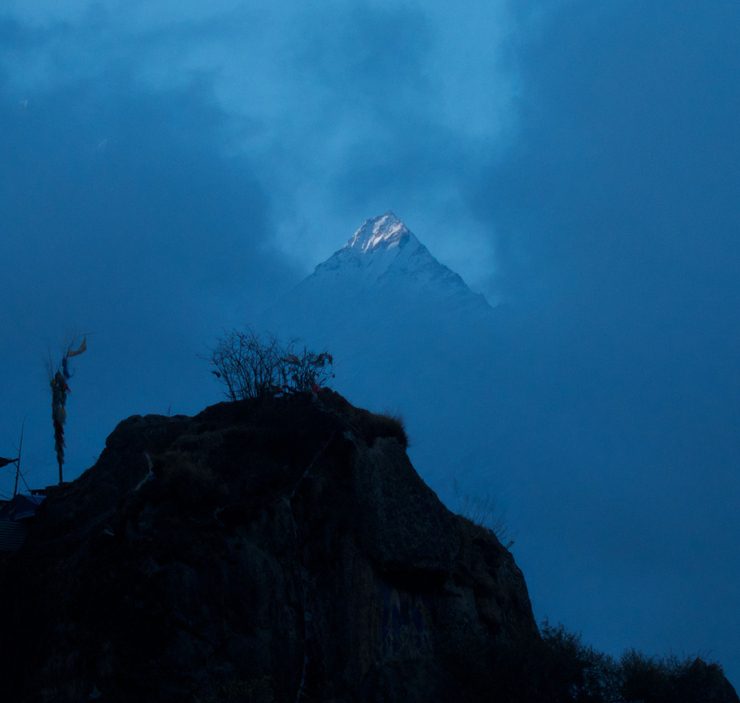 The mountain became obscured by clouds quite quickly- I decided to try to capture it atmospherically. That afternoon I got a message that after five days of struggle Brian and Kim had made it to base camp. I was really happy for them. 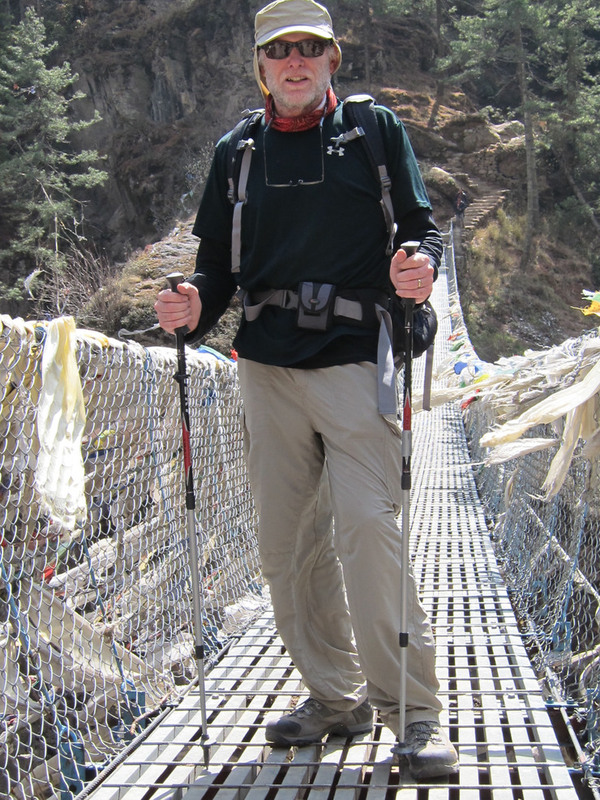 Meanwhile...Brian near Everest Base Camp. The mountain to the left is Pumori. 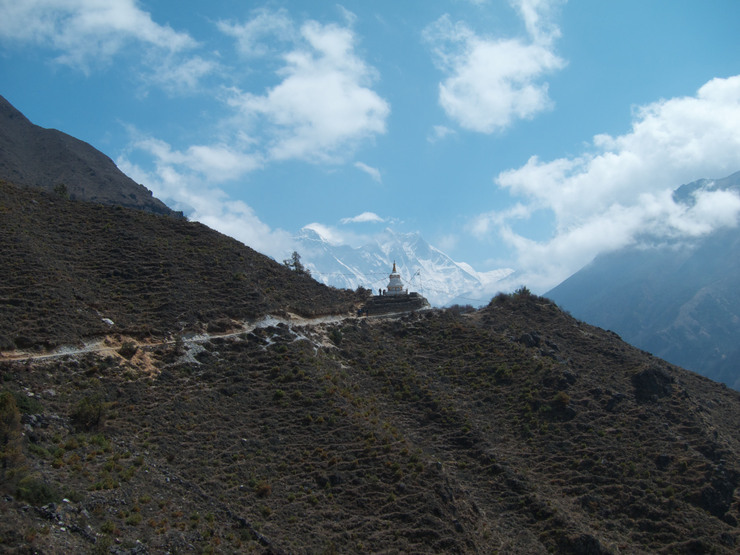 The next day, day six, I went back up to the top of the climb above Namche. 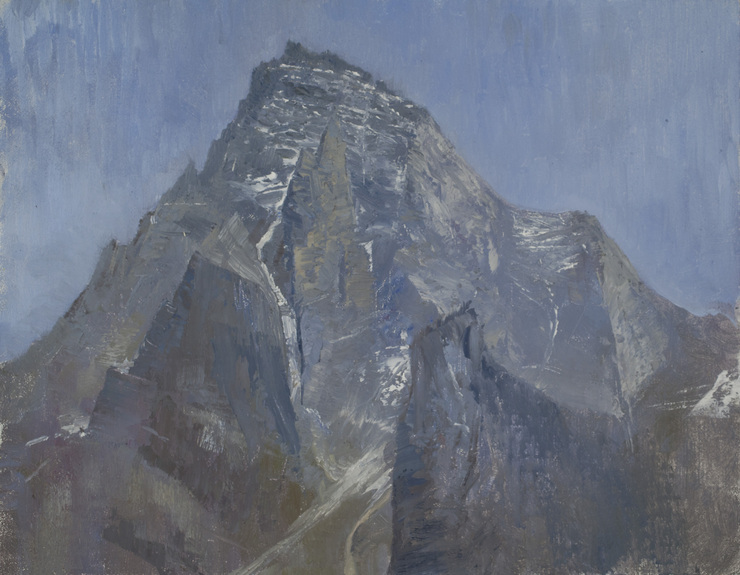 I was considering painting Alma Dablam, or Everest again, but a local told me that the spectacular mountain to the left, KuhmBila, was the holy Sherpa mountain, and had never been climbed...but he assured me that it would be OK to paint it. I had almost three hours to work before the clouds rolled in- and this time I was really happy with the results. Sometimes you know you have made some kind of breakthrough- this was one of those for me. I dont know if it shows, but I feel as if many problems were solved with this painting. I went down the hill feeling happy and for the first time on the trek, like I had a right to be there. 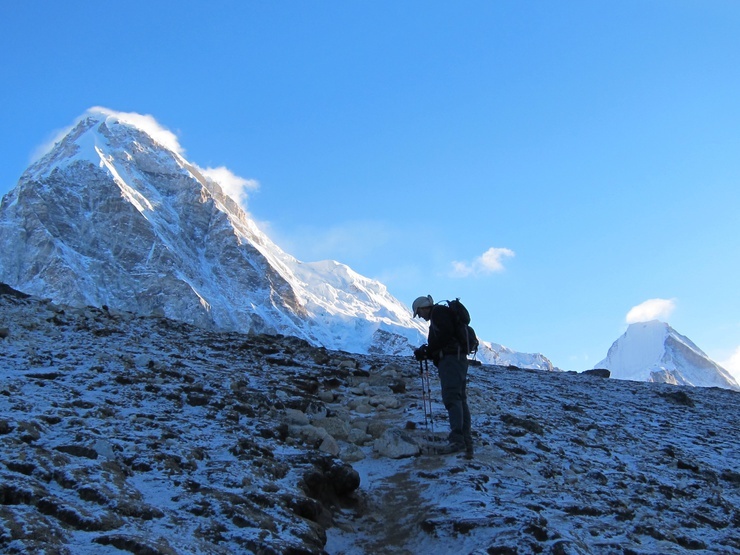 The next morning I l hiked up towards Everest and Tangboche to meet my friends. 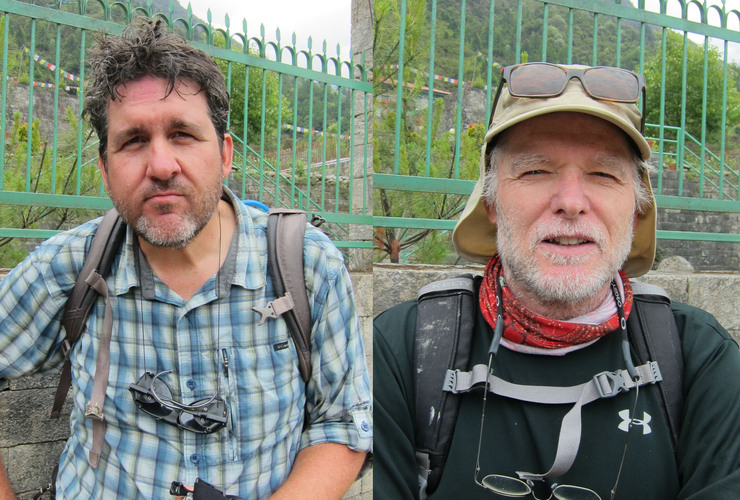 Three hours from Namche and about two from Tengboche, I met Brian Tek and Kim, as they returned from basecamp. I was never so happy to see anyone in my life. 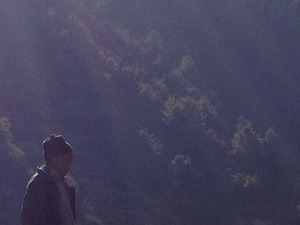 We then hiked together back to Namche, and that night had a nice celebration at the teahouse. 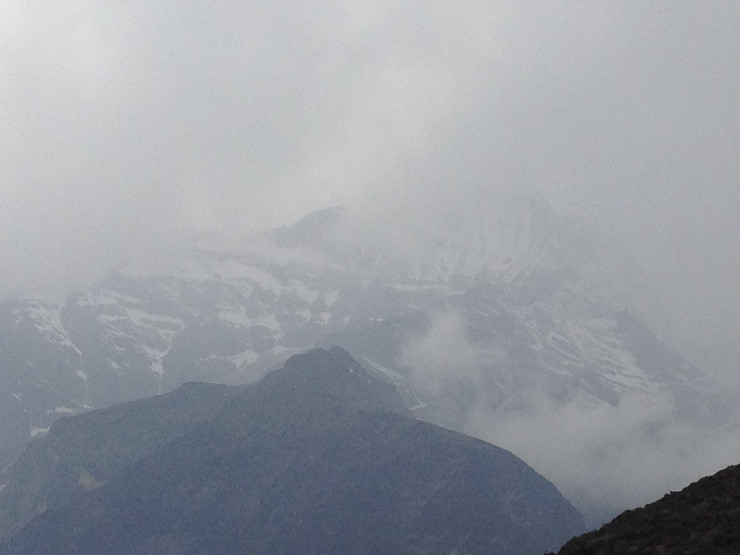 The next two days were spend trekking back to Pahding and Lukla. Even this net downhill travel was stressful but now that my body had acclimated I felt fine. I am quite certain that had I taken a slower trek schedule (20 days is not uncommon, though we didnt know this at the time) I would have been able to get to base camp. But I wouldnt have done the paintings. 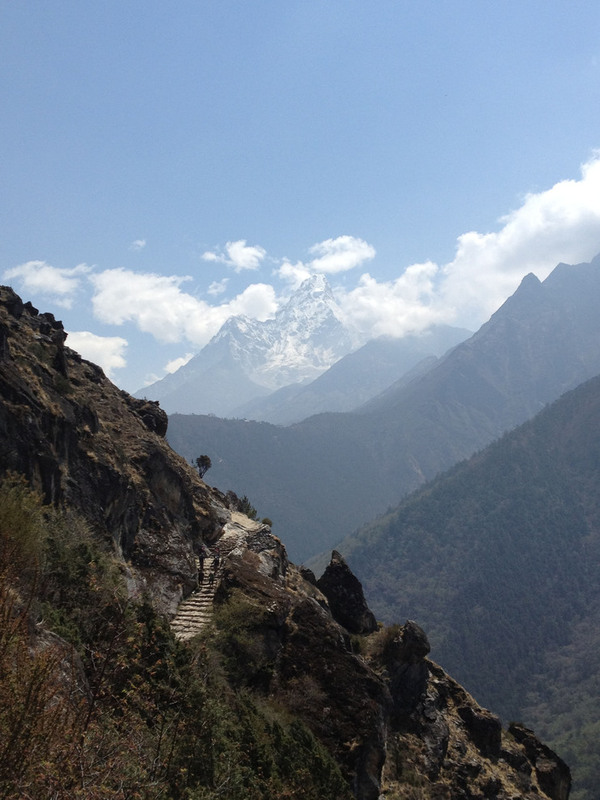 Ama Dablam on the road to meet Brian and Kim coming back down. On the road to Tengboche to meet back with my companions. 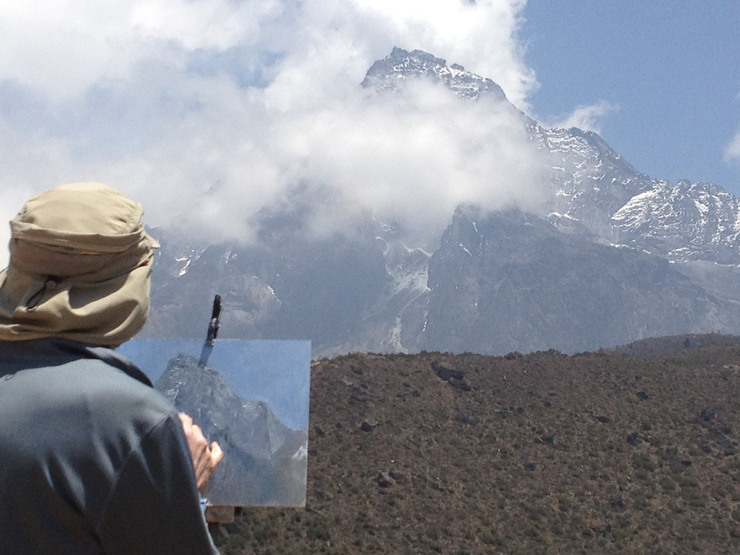 Ama Dablam in the background. Brian Stauffer, Kim Rana, and myself. On one of the many suspension bridges...right out of Indiana Jones. When we got back to Kathmandu we learned that there was a nationwide Maoist led strike going on, which essentially shut down the city. We spent three days holed up in Kathmandu trying to get out, and three more traveling to get home. Besides being a great artist and conceptual thinker, Brian is a great guy and was a great traveling companion. You couldn't ask for a better person to be with in this kind of situation.I would do it again in a minute. 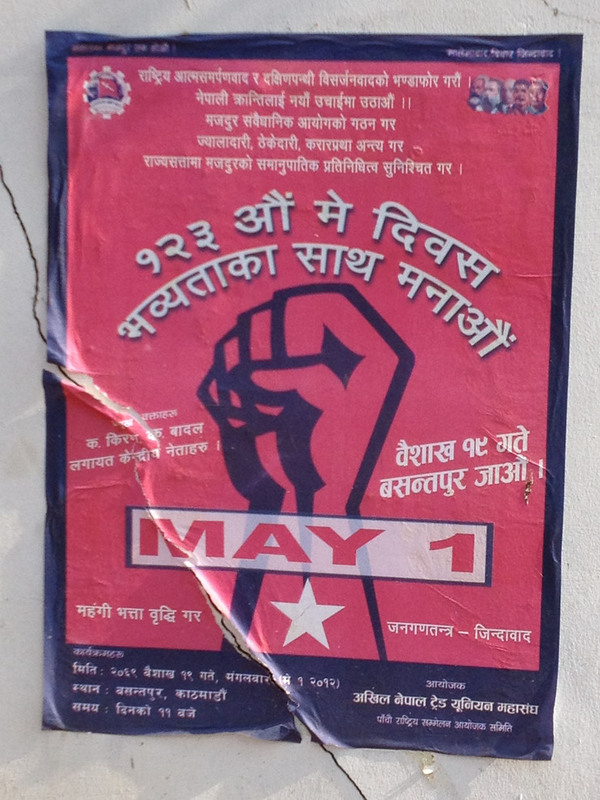 A poster in Kathmandu for the Banda protests and General strike. a relatively flattering view of Kathmandu. I have plans for 14 paintings. Ill try to have a show once they are done. I hope I can make some paintings that convey the sense of the place. I'll only paint what I saw with my own eyes. It occurs to me that this article may seem to be less informative of Brian's adventures- that is only because he is goiing to post his own article shortly. I can't wait to read it! I want to thank Alina Stauffer for relaying messages to Lynn when I couldnt send them, to Nepal Vision Treks and Keshav Wangle, a great company who really helped when the chips were down. Should this article make you think about doing a trek of this sort, you should get in touch with them-they are the best. Kim Rana was the best guide imaginable, and I think now a lifelong friend to both of us. 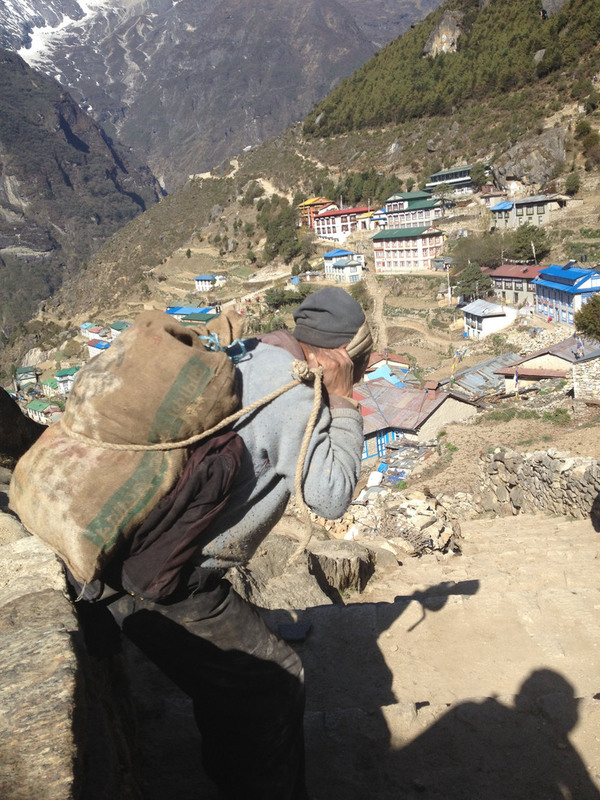 Our porter Sherpa Tek was great and we couldnt have done it without him. I also want to thank my beautiful Lynn for letting me go, and especially I must thank Brian Stauffer who invited me along, helped me get through some tough days and who with great effort accomplished his dream of reaching base camp. I think I got my dream too- though I didn't know what it was when I left home.